There are a number of different methods of production. 5 How do firms choose their method of production? Custom made clothes are an example of job production. This type of production makes a single, unique, product from start to finish. The product is mostly based on the requirements of the customer. Job production tends to be labour intensive, and often highly skilled labour is required. Examples include building ships, bridges and buildings, handmade crafts like furniture and made-to-measure clothes. Unique, high quality products are made. Workers are often more motivated and take pride in their work. Products are made according to individual customer needs, hence improves customer satisfaction. Production is easy to organise. Very labour intensive, so selling prices are usually higher. Production can take a long time and can be expensive, for instance if special materials or tools are required. Unit costs are very high. 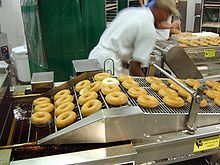 A bakery is an example of a business that normally produces in batches. In this type of production, products are made in batches. For example, a shoe factory could make different batches of shoes based on the size and colour of them. This method is suited to products that are identical to each other, but are only produced in limited quantities, or for a limited amount of time. Employees focus on one aspect of production, so labour is not usually highly-skilled. Batch production can also allow for the use of automation. Since larger numbers are made, unit costs are lower. Offers the customer some variety and choice. Materials can be bought in bulk, so they are cheap. Production is flexible since different batches are made. Workers specialize in one process. Workers are often less motivated because the work becomes repetitive. Goods have to be stored until they are sold, which is expensive. Initial set-up costs are high. Expensive to move products around the workplace. Storage space will be needed to store raw materials. Expensive. In mass production, large numbers of identical products are made. Production is often continuous, and is suited to high demand, mass market products. Examples include cars, chocolate bars, and electronic goods. Labour costs are usually lower. Materials can be purchased in large quantities, so they are often cheaper. Large number of goods are produced. Unit costs are relatively low. Machinery is very expensive to buy, so production lines are very expensive to set up. Workers are not very motivated, since their work is very repetitive. Not very flexible, as a production line is difficult to adapt. If one part of the line breaks, the whole production process will have to stop until it is repaired, delaying the production process. Maintenance costs are very high. Potential goods are produced in sets. These products are similar but are different in some respects (colour or design) after one set is done workers re-set the machines to make a different batch. Provides variety for customers, which attracts them towards the business. Changing designs slows down production. A gap in production causes the company to lose money. How do firms choose their method of production? The amounts they are likely to sell. The product they are making. The variety of goods expected by customers.